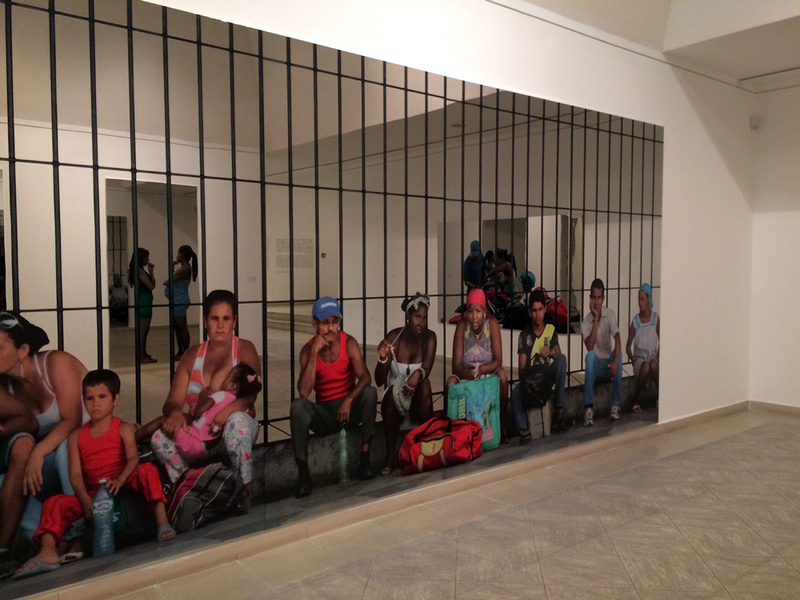 Michelangelo Pistoletto’s solo exhibition held at the Museo Nacional de Bellas Artes de La Habana between November 2016 and March 2017, was a celebration of his political, social, and artistic involvement in the Cuban capital, as well as his spatio-temporal aesthetic experimentations with mirroring. The exhibit that closed on March 13 was an ode to Pistoletto’s lifetime oeuvre. Two floors of the Arte Universal pavilion were populated by his art. The first, which welcomes visitors, was dedicated to his solo exhibition, and highlighted his Havana-based new work; while on the second floor past works fused and intermingled with the Bellas Arte’s permanent collection, a signature-exhibiting scheme of this prominent figure of the Arte Povera movement, who likes to put his art in dialogue with museums’ collections and spaces. The wide range of selections included his experimentations of the 1960s and 1970s with objects, materials, and photography: from Oggetti in Meno (Minus Objects, 1965-1966), to his photographic series La Conferenza and Raggi di persone (The conference and People’s rays, 1975). On the way to the museum’s Ancient Art section stood the more emblematic Arte Povera-inspired Venere degli stracci (Venus of the Rags, 1967-1974), a marmoreal white neo-classical status of Venus looking down at an immense pile of colorful rags, that dwarfs her monumentality. 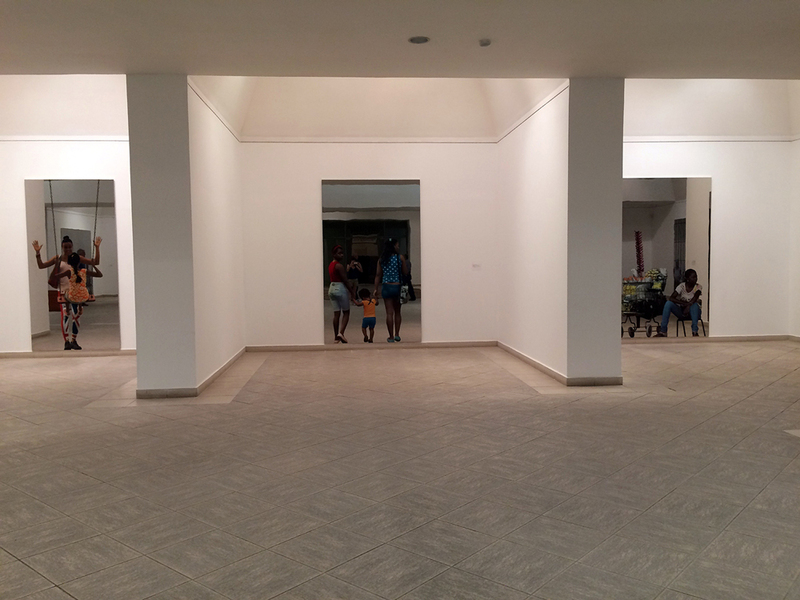 Pistoletto’s experimentation with specularity, multiplicity, and fragmentarity, and his new Cuban everyday life-based series were the most exquisite, delicate, and political elements of the exhibit. The artist’s interest in mirrors dates back to 1970, coming out of his research into time and memory, division and multiplication. The solo exhibit offered a retrospective of his experimentations in specularity, from Mirror Cage - Double Square (1975-2007), Two Less One (2009-2011), Buco Nero (Black Hole, 2010) and Vortice (Vortex 2010-2013). Thirteen less one is the first mirror series conceived in Havana. It is the result of Pistoletto’s performance The breaking of the mirror at the 12th Havana Biennale in 2015 where the artist, in front of an astonished crowd, smashed the mirrors into a myriad of fragments with a big hammer. The 13 broken mirrors form part of the Museum’s permanent collection today. The act of breaking a mirror for Pistoletto is related to the multiplication of its pieces and reflections, rather than its material destruction, and is deeply linked to his research into “the fourth dimension; seen here through the relationship between the present and memory,” as he explains in the text accompanying the artwork. Forms, shapes, cracks, and holes created by the act of breaking are frozen in the now-exhibited broken mirrors as a memory of the past, the reflecting surfaces incessantly revealing the ever-changing moment. 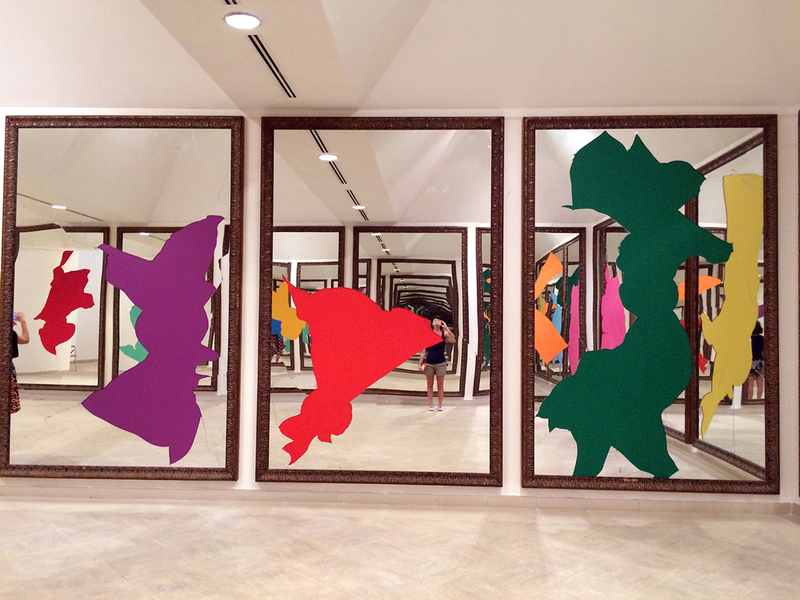 Pistoletto’s Mirror paintings are unique exactly because of their “presence in time and space,” which is made possible by the artist’s life-long research into the temporal dimension and participation through the combination of techniques and media. 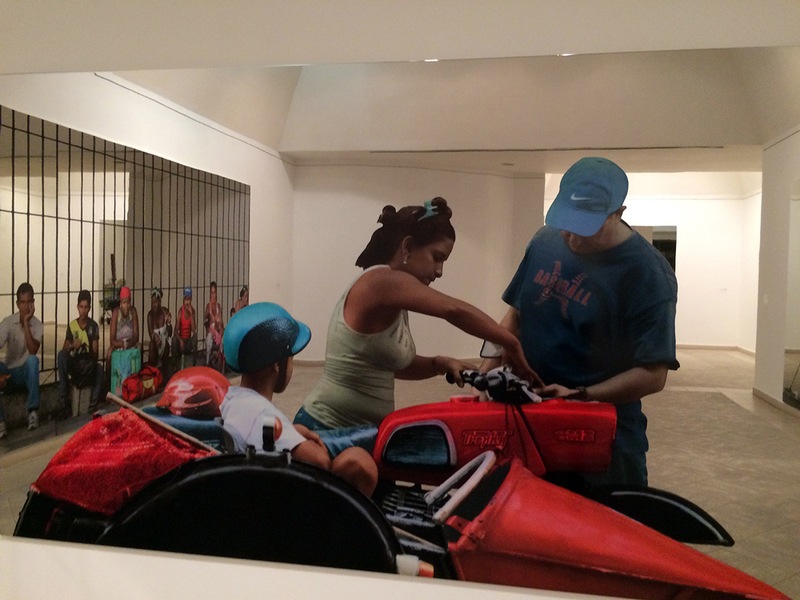 Following this research into the relationship between present and past, the 18 Mirror Paintings explicitly conceived for this exhibit brought Havana’s street-life scenes into the Bellas Artes. These silkscreened, life-size photographic images of Habaneras and Habaneros printed on top of mirroring surfaces bring the viewer to the role of participant into an everyday life scene. A typical Havana three-wheel coco-taxi drives through the streets of the city, mother and daughter play on a swing, a street-vendor sells peanuts and rositas de mais, men play chess, a family gets ready to take a ride on a sidecar, women buy colorful fruits at a kiosk. These are some of the eighteen scenes you can participate in – for you will find yourself included in the picture, your image playing and reflecting on its surface. The eighteen mirrors return still images of Cuban society at given moments in the past, through the silkscreened technique – moments that are constantly made anew by its reflective properties as the changing reflections are viewed and experienced in the present moment. They bring you back into the crowded, lively and busy streets that you have strolled through to enter the museum. In 18 Mirror Paintings, Pistoletto draws on interplaying forces to create inclusion: not only does the observer maintains her bodily presence by way of her reflection on the surface of the work of art, but she does so in an ecological relationship to time and space. She is immersed and reflected within her ever-changing environment, while interacting with the stillness and past of the photographic image. The silk-screen techniques and digital tools used to enlarge and print life-size photographic images onto the mirror surface provide a bodily and textured presence of the image itself, which becomes part of the environment reflected into the mirror, and is made anew by every single interaction. Together with time and inclusion, participation is another key feature in Pistoletto’s work. His artistic involvement in Cuban everyday life is socially and politically oriented. Since 2014, he has been working with local artists to create collaborative performances, and to create a base for his Galleria Continua, in an ancient 1950’s movie theatre in Centro Habana’s Chinatown. In 2014, Pistoletto organized the first Rebirth Forum “Geographies of Change” in collaboration with the United Nations and local artists and institutions, establishing the Cuban Rebirth Embassy. Along with his “diplomatic-artistic” work, a performance inspired by Pistoletto’s symbol of “Rebirth” (a three-circle symbol created by the artist, that combines an infinity symbol of continuity between the natural and artificial, with a third circle of transformation) was staged, in collaboration with Cuban artist Alexis Leiva Kcho, with fishermen’s boats floating in three circles in the sea in front of Havana. This took place on 16 December 2014, the day before former-President Obama and Raul Castro announced the reestablishment of diplomatic relations between the two countries. The impact of the performance was not only timely and political, but also spatial and social. The sea, for Cubans, represents hope and despair, life and death. Source of life and sustainment that is limited by strict sailing regulation, but also hope for building relationships, and death and despair for those who tried to escape the isolation the island has witnessed through the years and never came back. 1. Leon Battista Alberti De Pictura II, 46-47, cited in: Stoichiță, Victor Ieronim. 1999. A short history of the shadow. London: Reaktion Books, p. 61. My translation. 2. Benjamin, Walter. 1969. “The Work of Art in the Age of Mechanical Reproduction” In: Illuminations, edited by Hannah Arendt, translated by Harry Zohn. New York: Schocken Books, 1969. (Accessed April 6, 2017). 3. Grau, Oliver. 2003. Virtual art: from illusion to immersion. Cambridge, Mass: MIT Press, p. 249. 4. Grau, Oliver. 2003. Virtual art: from illusion to immersion. Cambridge, Mass: MIT Press, p. 193. 5. Lynn, Greg. 1999. Animate Forms. New York : Princeton Architectural Press, p. 10. 6. Straw, Will. 2010. “The Circulatory Turn.” In The Wireless Spectrum: The Politics, Practices and Poetics of Mobile Media, edited by Crow Barbara, Longford Michael, and Kim Sawchuk. Toronto: University of Toronto Press, p. 23. Eleonora Diamanti is Limited Term Assistant Professor and SSHRC Postdoctoral Fellow at the Department of Anthropology, University of Victoria. She was Post-doctoral Fellow in Urban Humanities at McGill University’s School of Architecture from 2014 to 2016. Eleonora holds a doctorate in Semiotics from the Université du Québec à Montréal (UQAM). Her PhD thesis won the 2015 Jean-Pierre Collin Award for the best dissertation in Urban Studies from the National Institute for Scientific Research/Center for Urbanization, Culture and Society (INRS-UCS, Montreal). Her research interests focus on urban culture, the festivalization and aestheticization of contemporary cities, media, night studies and research-creation.